One of the most common questions that people ask me is "how do you find the time to cook all of that delicious looking food, go to the gym, and keep up with your job?" I've talked in previous blog posts about how I believe in planning weekly dinner menus. One easy way you can do that is by cooking a protein in bulk and using it in different ways. 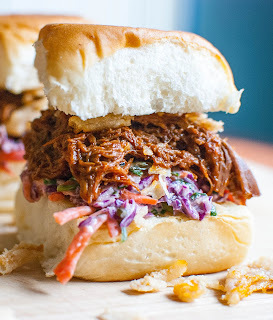 In this post, I'll show you how to slow roast a big hunk of beef that you can use in sliders, tacos, stews, and so much more! 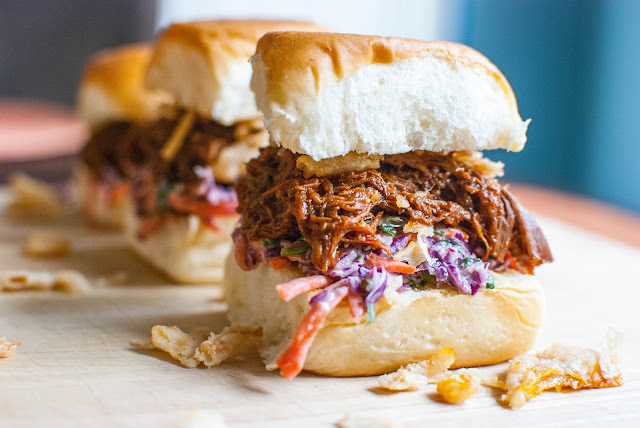 Here's a delicious slider that consists of a slow roasted beef that mops up a warm spicy bbq sauce and is served with a low calorie yogurt slaw. It's all held together with toasted Hawaiian sweet rolls, the most underrated carb in existence. I plan on making these for my Super Bowl party since my Southern mother-in-law is going to be rooting for the Carolina Panthers! 2) Add first four vegetables to a roasting tray and roast vegetables for 30 minutes. 3) Squeeze out roasted garlic, transfer vegetables, and remaining ingredients into pot. Lower temperature of the oven to 250. 4) Add water to pot until all ingredients are barely covered. 6) Remove pot, carefully remove lid, remove beef onto a cutting board, and strain out vegetables. You'll now have a flavorful beef broth that can be used for soups and stews! 7) Use tongs and a fork to pull apart the beef until it is well pulled apart. If you see any pieces of fat, discard. 4) Assemble as seen below. You can add crispy fried onion straws as an optional step!